2015 Note: Dear reader, I must apologize for the following review which I wrote... in the spring of 2014(? ), and it was technically something that had been stewing in my brain even longer than that (you'll see what I mean at the end of the review). 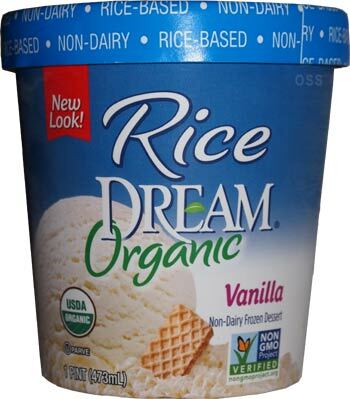 I'm only releasing it now because Rice Dreams has recently redone their packaging and I wanted to point it out in case anyone has had trouble finding it (their website hasn't even updated yet). 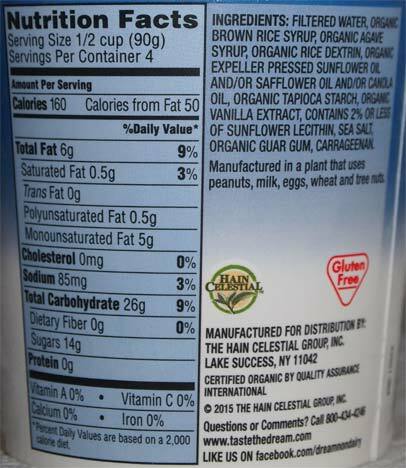 Please note that the allergen warning on the nutrition label has changed (you can find it at the end of this post). Oh, for whatever reason, I stumble upon Almond Dream way more than I do Rice Dream, what's up with that? [Original 2013/2014 Review] If there's one thing I regret about the early days of this blog, it's the fact that I didn't engage in people's comments like I should have. I just kind of assumed I was already making my point, so why reiterate it in the comment section, but I wasn't thinking about the fact people would take that as me ignoring them. My point is that we do value your comments, and to prove it, I'm going to review something for one of our more vocal commentors. 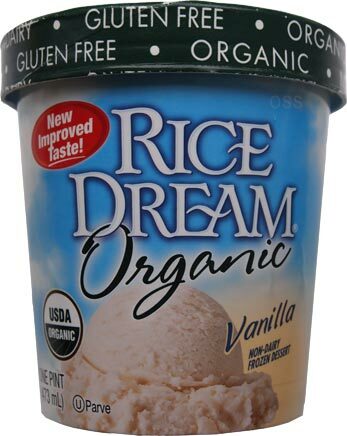 This is Rice Dream non-dairy "ice cream"
Rice Dream comes in six four flavors: vanilla, chocolate, strawberry, Neapolitan, mint carob chip, and cocoa marble fudge. I've actually tried the first three, but vanilla is the only one we keep in stock. It's fairly hard to find, and in fact, it was only a few weeks ago that I discovered a Shaws supermarket that carried big quart containers (on sale for $6.99, woohoo!). "Ummm, Dubba, why do you stock frozen non-dairy dessert when you never like these flavors?". Well, as I've been meaning to discuss for at least a year now, this is the only "ice cream" my son will eat. We've tried tofutti cuties and tofutti hooray hooray bars, but he just didn't like him. We tried coconut milk ice cream too and that was a bomb. No matter what else we try, we always keep coming back to the vanilla. Here's a little tip. I never actually serve it in it's solid form. I stir it up and give it a soft serve consistency. My son adores it this way and will eat the whole cup, sometimes two. Oh, that reminds me.... no, calm down Dubba.... Just do me a favor and never insult food allergies in the comments section on this blog, go take your uninformed attitude somewhere else. I get it's hard to understand if you don't have to deal with it, but there are tons of kids (and adults) who have trouble. Let's do our best to help them, not insult them. Final 2015 Note: The old label use to say that good manufacturing processes are used to avoid cross contamination because it was made on the same equipment as nut products. The new label just says made in the same plant as nuts. I have no idea if that's an upgrade or a downgrade, so interpret as you will or contact the manufacturer if you are concerned. 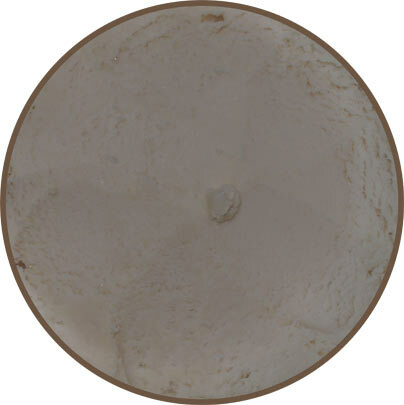 Have you tried any of the dairy free ice creams from DF Mavens? I tried their coconut milk Alphonso Mango, and it was delicious. Perhaps the best non-dairy frozen dessert I've had. I think it is part of the same company that owns Desserts that Matter. I have seen them at my local store though I haven't tried them (though ironically I have tried desserts that matter). The biggest problem for us is a non-love of coconut. It's funny because my saw did enjoy coconut milk "yogurt" for a time, but I could never get him in to any of the coconut milk "ice creams". Gotcha. 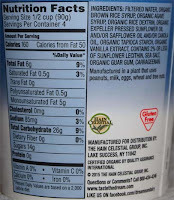 DF Mavens also makes soy milk and almond milk based favors; not all of their products are coconut based. I totally agree, it's the worst thing I have ever tasted. So Delicious Vanilla coconut milk is our fave. Melts like ice cream. This Rice Dream stuff gagged me and my 2 year old. I put it in the sink to melt, an hour later still solid stuck in the upside down container like glue. But do not buy the "sugar free" So Delicious, I thought that was the worst until I tried Rice Dream, although it didn't gag me, just tasted like fake sweetner. We eat rice everything, rice cakes, rice crackers, rice cereal, sooo, not afraid of rice.